If we could explain everything that was important in our pictures we could just be writers. What a great photograph this is, Sherry, and I love the quote you chose to go with it. Lovely indeed! It means so many things to me. What a neat photo. 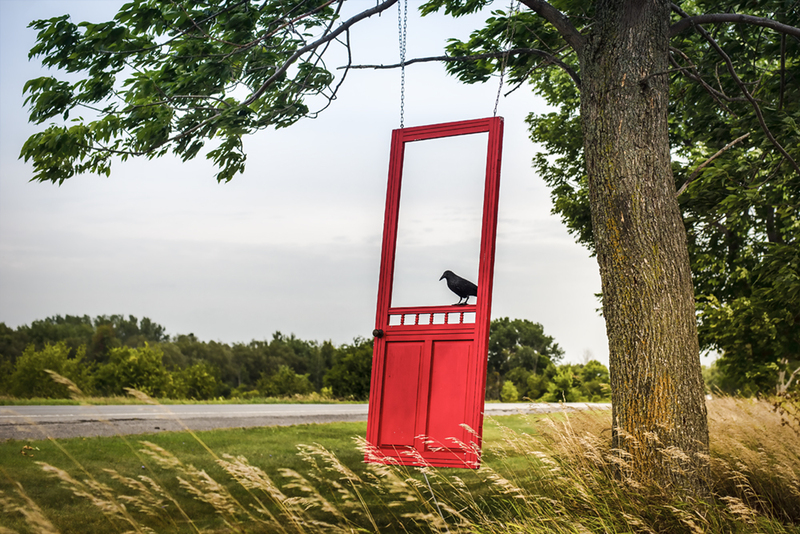 The red door stands out and having the crow on it just tops it off perfectly. I have always loved writing and photography together but sometimes, like in this photo, no words necessary. Just a gorgeous, once in a lifetime happening..so glad you were there to catch it. The door is stunning. Wish I had a tree to hang one from. That is just the coolest image Sherry. How cool is that with the door? I love that hanging red door on the tree. A lovely and unusual image! Sometimes, images say everything that needs to be said without a single word! Other times, we are inspired to interpret them in our own way. So true! I’m more and more thinking that writing and photography go hand in hand. A beautiful picture!